Stop reading if you're a friend or family member because you'll ruin your holiday gift surprise. 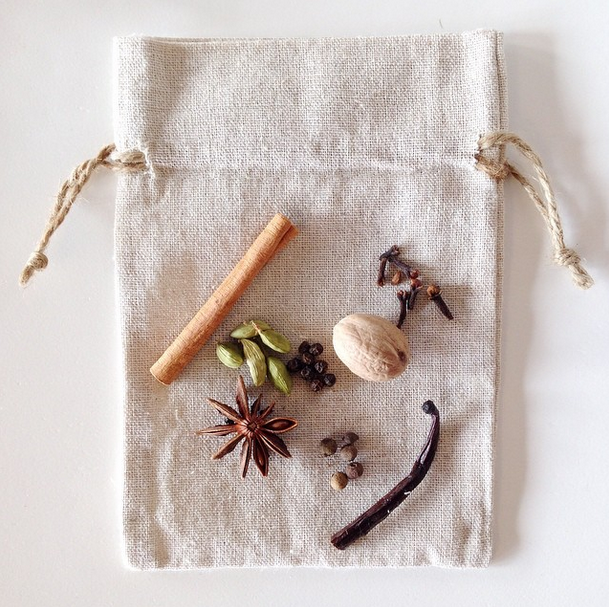 ... For the rest of you, this spiced vodka infusion is a perfect DIY gift. I fell for this during Salt & Sundry's most recent Drink Lab class, hosted with our Union Market neighbors Cordial Fine Wine & Spirits. Barman Dan Searing, who's graciously hosting the series, provided the recipe. Make a few batches and divide into small bottles. Or create a spice kit for your friends and give it with instructions and a bottle of good vodka. The infusion is delicious in cocktails or to spike hot cider. Place the spices in a heavy sauce pan and toast over medium heat for several minutes. Put the orange peel and toasted spices into a mason jar, add the vodka, and seal tightly. Store the jar in a cool, dark location, and shake daily for 7-10 days. Once the spices have infused the vodka, strain contents with a mesh strainer and coffee filter into a clean bottle or jar. Mix with equal parts simple syrup in a bottle that will hold about 30 ounces or more. Exactly how much of this would you use in a drink/cocktail? Any recipes you suggest using it in? Hi Jamie! We added about 1.5 oz of the infusion to warm cider, which was delicious! Keep some of the infused vodka by itself (don't add the simple syrup) and add an ounce or two to ginger beer for a spicy Moscow mule.